Part of the Million Dollar Advocates Forum, which consists of less than 1% of all U.S. lawyers. Haleh Shekarchian has been recognized for upholding the highest ethical standards in practice. If you think you have a claim, contact us today and we can review your case at no charge. Attorney Haleh Shekarchian has years of legal experience and has devoted her legal practice to help the injured and bereaved get the justice they deserve. As a result, Attorney Shekarchian has recovered millions of dollars on behalf of her clients. Ms. Shekarchian is a proud member of the Million Dollar Advocates Forum®. Since 1993, the Million Dollar Advocates Forum® is a prominent organization of trial lawyers in the United States. Membership is limited to those attorneys who have won million and multi-million dollar verdicts and settlements are invited to join. Membership includes over 4,000 of the top trial lawyers in the United States, which consists of less than one percent (1%) of all U.S. lawyers. As a member of this group, Attorney Haleh Shekarchian has been recognized for her impressive case results and legal ability in representing personal injury and wrongful death clients in Southern California. At the Law Offices of Haleh Shekarchian, we have been representing injury victims and their families in all types of personal injury, workers' compensation, and wrongful death cases since 1993. Our firm has distinguished itself by consistently providing our clients with the highest level of legal service for 26 years. We take pride in offering a distinct level of service: our clients always come first and they always have come first. Throughout our years of legal service, we have been recognized by professional organizations for our excellence, commitment, and incredible case results. 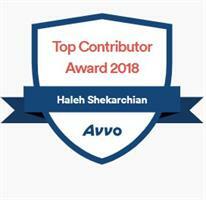 Our lead attorney, Haleh Shekarchian, is highly-rated and reviewed on Avvo for her skills and ethics. We have also been selected by the Million Dollar Advocates Forum for achieving verdicts and settlements that collectively have secured millions of dollars on their behalf. Our Beverly Hills personal injury lawyer delivers aggressive and effective representation for individuals who have been wronged or injured. We never fail to provide our clients with caring compassion during their time of need. By striking a balance between legal efficiency and genuine sincerity, we earn the full trust and assurance of our clients. You Focus on Recovering. We Do the Rest. We have the ability to handle all aspects of a personal injury claim, including dealing with insurance companies and corporate attorneys, all while upholding the highest ethical standards in legal practice. Haleh Shekarchian is recognized for her proficiency in settling and litigating a wide spectrum of personal injury and wrongful death claims and is well-respected by defense attorneys, judges, and insurance companies in Los Angeles and the neighboring counties for her integrity and compassionate representation of her clients. Injured? We can come to you. Call us at (888) 449-9606 or request a confidential consultation. We can discuss your case in the comfort of your home or hospital, by request. You Don’t Pay Anything Upfront Unless We Win for You! “Her and her staff handled mine and my father’s personal injury case professionally. They were always making sure we were being well taken care of. My accident was on the morning of Dec 31st while I was taking my father to a Doctor’s follow-up appointment after he'd been released from hospital due to a minor heart attack. My car was a total loss and that same day I called and left a message and her staff called me that same day! They also called me on New Year’s Day to make sure my father and I were taken care of. I loved their fast service and attention to us. I recommend this team.” – Elizabeth R.